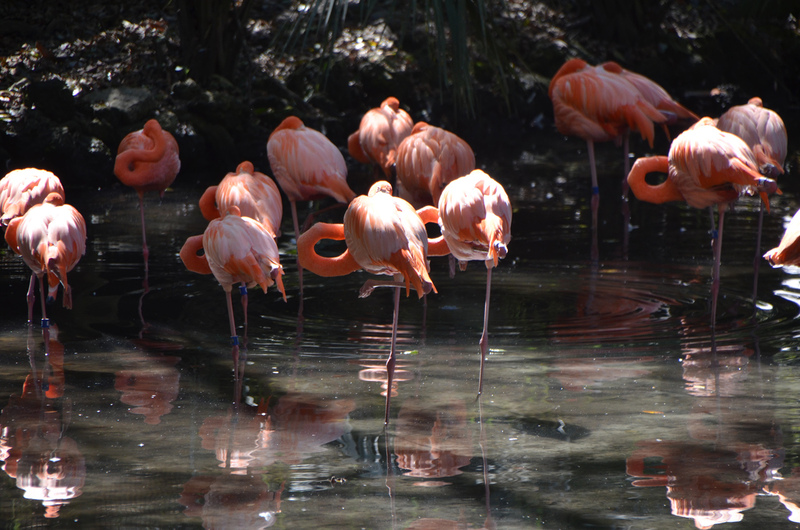 November 12th, 2015 – Homosassa Florida – After canoeing with the Manatees I wanted a little better view. 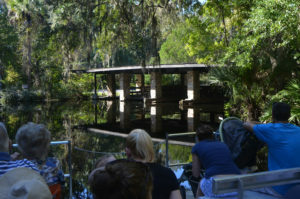 I had heard that a nearby Florida State park had an underwater viewing area, so I planned my visit to Ellie Schiller Homosassa Springs Wildlife State Park. I didn’t really get the view of manatees I had expected, but the park is pleasant. It would be great for young families and the grandparents too. 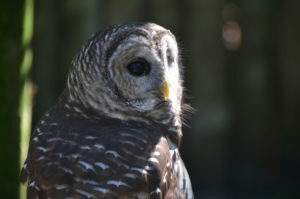 Cool, shady grounds, plenty of other native animals on display, and some concessions and gift shops. I took the boat from the large parking area along the highway, but they also operate a tram as parking at the park proper is very limited. For me the boat ride was a big part of the entertainment. The boat works its way a little over a mile along pepper creek, a small canal through a mature forest. The ride is smooth and peaceful, and there’s plenty of wildlife and scenery, so have your camera ready. The narration along the trip helps orient you to the features and history of the park and that helps things fall into place without a lot of reading. We saw turtles, wading birds and ducks, as well as an Osprey nest on the boat ride. You will purchase your admission when you arrive at the park proper. 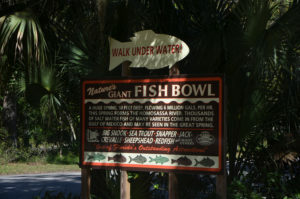 The entrance is a short walk from the boat, crossing a country road “Fishbowl Drive”. Once in the park the paths are wide and mostly smooth, with much of it being wide board walks. There are two primary loops, the shorter to your left as you enter, the longer to your right. To the left you will find the underwater observatory or “fishbowl” as it had been advertised in the past. 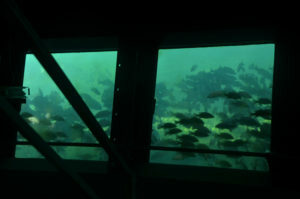 It is a large floating platform hovering over a crystal-clear freshwater spring. The slightly warmer water of this spring attracts manatees during the slightly cooler winter weather. You might not guess that the platform is floating given how stable it is. The glass viewing panels however aren’t as clear as they once were, some places are better than others. I’m told the friends of the park are raising money to have this addressed but while I was there it was a little disappointing. 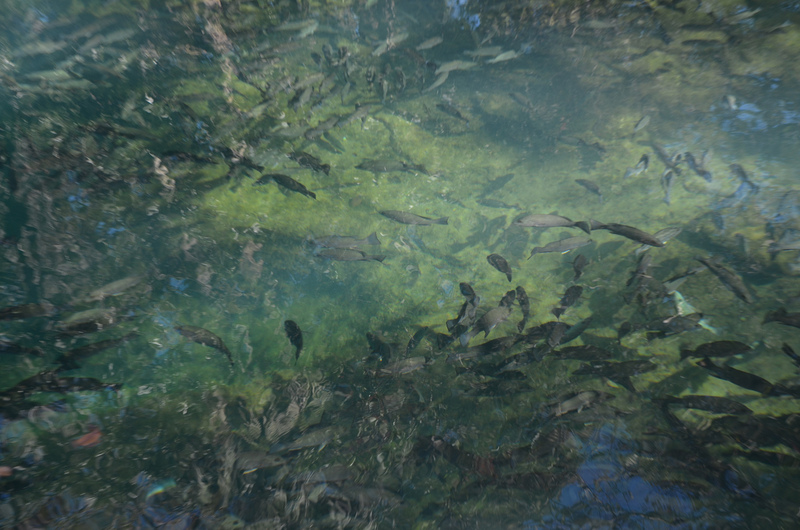 There was a huge school of fish swimming around the spring, staying mostly in its shadow, but very interesting to observe. However, it was a little early in the season for manatees, so I didn’t get that underwater view I had hoped for. 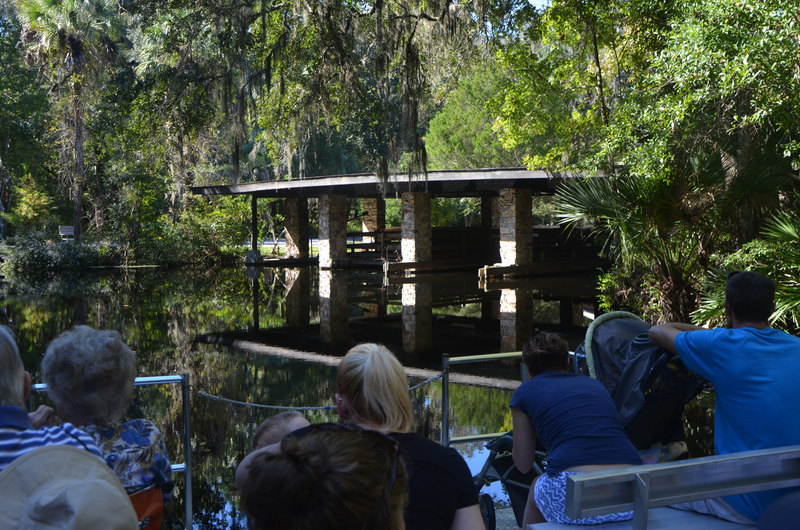 Further along this loop is the children’s discovery center and some opportunities for picnicking or just enjoying the waterfront of the Homosassa river. On the far side of this loop is where they do manatee programs in the off season. The other loop is called the “Wildlife Walk”. 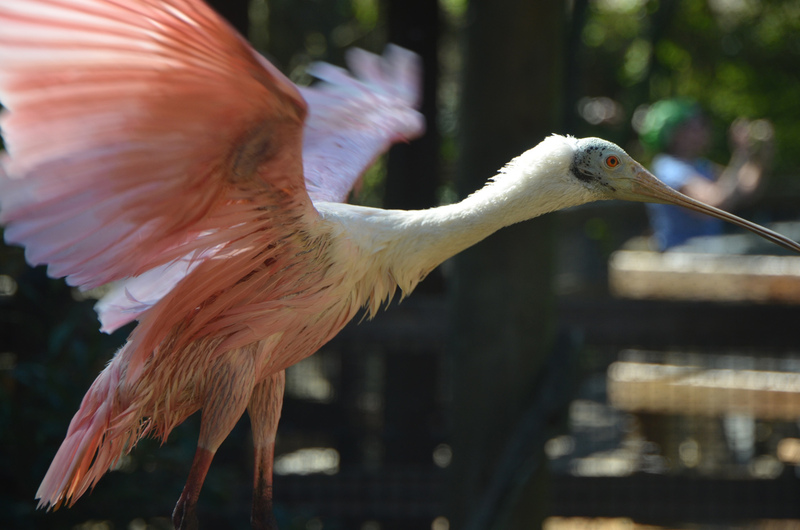 Most of the birds and animals living at Homosassa Springs cannot survive in the wild. The park provides these animals with a habitat and diet that is as natural as possible. 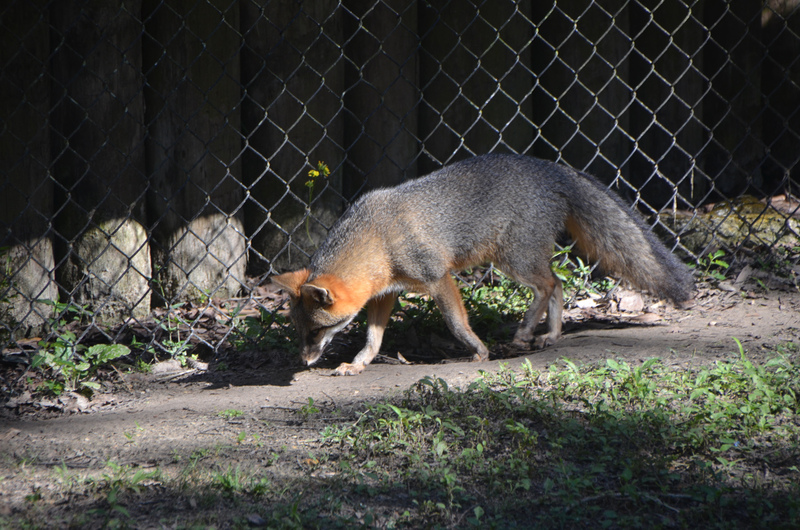 If you are sensitive to the feel of a zoo, it may not be your cup of tea. On the other hand, you would be hard pressed to see many of these animals in the wild and it will be much more engaging to young children. I was able to catch the Alligator ranger talk, and I’d recommend it as one you should see. In addition to Alligators you’ll have that opportunity to see lots of wading birds and birds of prey out in the open. Presumably they have their flight feathers trimmed. 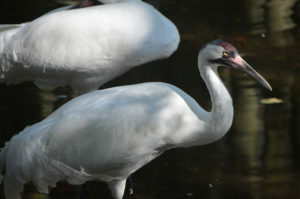 Also a new exhibit has smaller birds in a covered marsh exhibit. Put a coin into a dispenser and get some food to toss to the ducks. Along the wildlife walk you’ll have also the opportunity to see Wolves, Foxes, Black Bears, Panther, Cougar, and Bobcats, Black bears, River Otters and Key Deer. So, a great place for the extended family to be able to do something together, and I’d recommend a picnic too. Historical sign. Currently just outside the park. Historical sign. 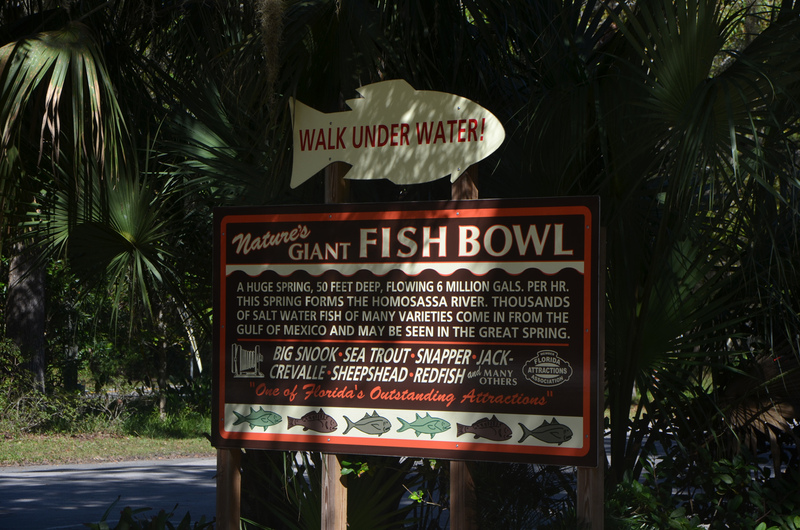 “Giant Fish Bowl”. Currently just outside the park. All aboard the pontoon boat for the ride to the park. Loading is done at a dock under the shade of the building above. You’ll find food and gifts on the floor above. Looking back at the highway end docks. Turtles on a float near the dock. Great Egret along the shores of pepper creek. A line up of turtles along the boat ride. Osprey nest along the boat route. Arriving at the park end of the boat ride. Red Wolf. If you look closely at this picture you can see the fence out of focus in the foreground. 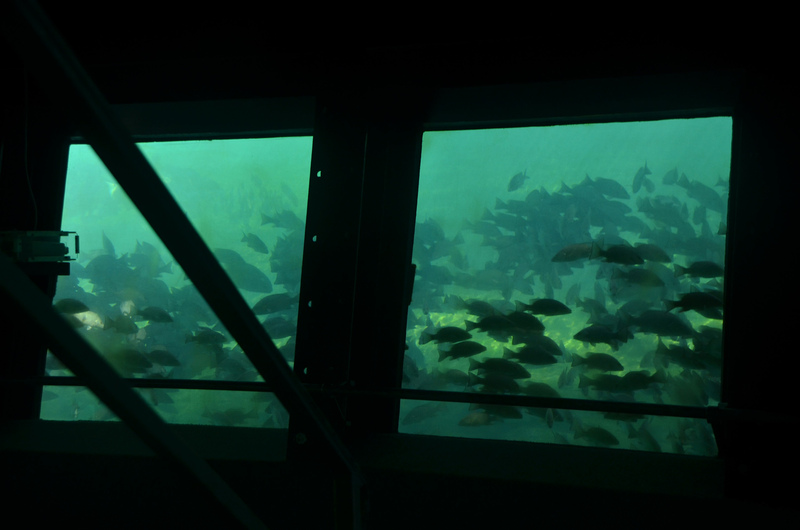 Walking along the dock to the underwater viewing platform. Looking down at the fish schooling in the spring. They would swim out to the edge of the shadow and then turn back. Another view of the fish from above. Walking down into the viewing area. I had arrived about ten minutes before a large group of school children. Quiet and all to myself. Looking out the windows into the spring. The “Key Deer” is a small (endangered) species of deer that lives only on a couple of the Florida Keys.